Many times, when purchasing a dog, folks do get the horse before the cart. By that, I mean, they do research before buying. But, when they find the perfect litter of pups, how do they know which pup to pick? This generally leads to calling for my help in assessing the litter. One of my favorite assessment techniques is age-old yet has stood the test of time better then the more modern forms of evaluation. In every case that I have personally used this test, and then contacted the dog owner one year later, the original test results have proven positive. Here’s the process. Take the litter mates, one at a time, and place them in the doorway of a room they have never visited before. You stand still and remain quiet. Your only requirement is to observe. In general, you are to qualify what you see. Take notes. The pup that backs away from the doorway will be submissive. The pup that neither enters the room or lies down will be indecisive. The pup that stands in the doorway, whining for his litter mates will be a follower. The pup that bolts into the room, heedless of the unfamiliar territory, will be difficult to control and/or will be aggressive. The pup that slowly enters the room, alert, nose to the ground, checking each nook and cranny, will be the ideal companion dog. Put a color ribbon on each dog and label the results on your notepad. Now, the second test. For this you will need one person for each pup…five pups, five observers. The submissive pup will still be submissive, and his attitude may influence the indecisive pup. The indecisive pup can easily be influenced by any of the other pups. The follower will join whichever group is the largest. The aggressive pup will circle the room like the antagonist he is while straining to subject all the other pups with his craziness. The ideal companion dog will be the only constant; continuing to maintain his composure in the midst of mayhem. And now the final test. Close the door to the room. Put all the pups in a box in one corner of the room that they can easily climb out. Walk away from the box and sit in the middle of the room. Make notes on what each pup does according to the color of ribbon. Who climbs our first? Who stays in the box? Who whines? Who leaves the box as if he’s an escaped convict? Once out of the box how do they relate to you; jumping all over you, nipping for attention, cuddling in your lap, ignoring you, staying just far enough away so you can not reach out and touch. You would judge the actions of these pups in the same manner as when you placed them in a doorway of a room they had never visited. These are my favorite litter evaluation tests and are basic enough so anyone can perform a fundamental litter assessment. Friends: By the way, if this is the first of my columns you have encountered, feel free to visit jprestonsmith.com to read those that have been previously published. John Preston Smith is the author of “The Legend of the Last Dog.” All of his books are listed at jprestonsmith.com. Questions or comments: facebook.com/johnprestonsmith. Proceeds support Hoops Family Children’s Hospital in Huntington, W.Va.
Having trained more than 14,000 dogs since 1963, I have been asked certain questions repeatedly by my clients. They are five. Who, what, when, why, and where to buy a dog? Here are my thoughts. Who to purchase a dog for? I think everyone in the world should have a dog. The practicality of this, however, is not, well, practical. I believe dogs are one of the greatest gifts our Maker has provided. But, dogs are not for everyone. Kids…yes. But disposition, character, and temperament are critical…of the dog, that is. Training for young tykes regarding the do’s and don’ts should be taken seriously. Dogs are not pillows, trampolines, punching bags, or pull toys. Children should be taught not to pounce on a dogs’ most tender possessions…his feet. Should teenagers have a dog? Maybe. Their interests are usually scattered. I recommend a heart-to-heart before purchasing a dog for young people. Will they be willing to feed, exercise, groom, train and clean up behind the new addition? For adults, dogs can be child, mate, and empty nest substitutes. However, before purchasing a dog try this. Drive through your neighborhood. How many dogs do you see chained, fenced in small enclosures, or rummaging through garbage. My take: if these dogs had been procured for the right reason, then these travesties would never have happened. No matter who a dog is purchased for it should be approached as a major decision. A decision that is costly, long-term, and emotional. Yet, consider this, where else in the world, for a mere hundred bucks, can you purchase a life-long friend? What dog to buy? Purchasing a dog should not be a knee-jerk reaction. When you need a car do you run to the car lot and grab the first one you see simply because it’s “so cute?” Probably not. Rather, you consider size, how it will be used, the mileage, the initial cost and maintenance, new versus used, etc. Try this: Give a lot of thought to what you need from a dog. Disposition is critical. Do you need a protection, alarm, or family dog? Is size a factor (do you live in an apartment, house, or 50-acre farm?). Single or double coat (definitely double coated if he is to be an outside dog). Many veterinarians and dog trainers can help you with understanding the characteristics of different breeds. Or you can study the “breed standard” of any dog by going online. And while you’re at it, read articles regarding health issues. Some examples: Bulldogs may have respiratory problems. Pugs may have eye problems. German Shepherds may have hip dysplasia concerns. Elongated dogs like Dachshunds may have back problems. And finally, does anyone in your household have an allergy to dogs? Bottom line…make an informed decision. When not to buy a dog? I am not in favor of purchasing dogs for celebrations like birthdays, anniversaries, or as a replacement pet if you have not discussed this with the person receiving the dog. Don’t buy pups in the wintertime that you plan to leave outside. Don’t purchase a dog for a child unless you plan training both. Many dogs are not intentionally mistreated…however, too often our best intentions get lost in the shuffle after the excitement of the new family addition wears off. Why purchase a dog? Any of us who had a family dog when we were young know those times as memorable and special. I have previously mentioned how dogs fill a void in our lives in many situations. How about what dogs do for the military, the police, the blind, the autistic, and the disabled. In the early 60’s I advocated that nursing homes and homes for the elderly should have a resident canine. Why? For the same reasons that therapy dogs are used by volunteers in hospitals today. What do dogs bring to the table? Solace, comfort, relaxation, someone to talk with, friendship, good memories. They help us fight loneliness, depression, and fear. There are a gazillion reasons to buy a dog. Just be sure your’s is the right one. Where to buy a dog? The choices are three. From a breeder, a pet shop, or a rescue organization. From a breeder. When purchasing from a breeder be sure to see the sire and dame of the litter. In dogs, what you see, mostly, is what you get. If the parents are friendly, aloof, accepting, standoffish, reserved, playful, aggressive…then those balls-of-fur fighting for your attention will most-probably maintain the disposition of their parents. Many dogs a breeder has are not good enough to fit the ideal of the standard of the breed and will not be shown in the confirmation ring at a dog show. Therefore, those dogs are sold as “pet quality.” A pet-quality dog from a breeder will be more expensive than purchasing a mixed-breed dog. However, always compare price and cost. Price is what you pay for a dog. Cost is the money you will put out over the life-span of your pet. Don’t be afraid to ask your veterinarian about which dog he believes will be healthier in the long run. From a pet shop. I am not a fan. From a rescue organization. Probably, this is where most folks get dogs. However, the temperament of mixed breed dogs is often based on speculation. What really occurred in the life of a dog that caused him to land in a county shelter? Was it relocation, divorce, abuse, biting, health issues, or a lack of training? All my childhood dogs came from the city pound. They all had quirks, but they were great dogs and I loved them. In addition to your local Humane Society, there are many organizations that sponsor rescue and adoption for pets needing a forever home. One such agency, Little Victories, is in Barboursville, West Virginia, near my hometown. The next question coming from many folks is this: How do I know which dog to purchase? I’ll discuss temper testing and assessment techniques in my next column. What is it about dogs? In the wild they search for, stalk, chase, grab and kill their prey. This highly honed aspect of the pack instinct comes from one of the most organized and social animals of all time; the wolf. And yet, in partnership with man they will retrieve, guard, hunt, herd, seek, protect, and search. We can talk to them, confess to them, and blame them for our bad day…and still, under all circumstances, they great us daily as long-lost friends. We use them more for our own edification than for theirs. Too often, after the excitement of puppyhood has worn off, we leave them to fend for themselves. We dispatch them to the basement, garage, or backyard. Fortunately, we do not do this to our children! We leave them cooped up throughout the day until they are forced to relieve themselves, and then oftentimes we reprimand them for soiling the carpet. We reprimand them for the slightest wrongdoing because we are moody, irritable, or short-tempered…which, by the way, is absolutely the worst time to correct a dog. In my training classes, I constantly reminded my students that the dog who piddled on the carpet because you left him in the house for ten hours is the same dog that anxiously awaits their return home every day with a wagging tail, bounding with excitement, and ready for a jaunt in the park…or a mere pat on the head if that’s all you are willing to offer. And guess what, they’d be waiting with that same exuberance whether you were a banker or a bank robber. Speaking of dog’s behavior leads to similar topics. What do dogs think about, do they rationalize, are they problem solvers, do they think about their next meal, are they bored when left alone, etc.? I do not want to get in a battle with those not in agreement with my opinions. I am not a scientist, nor animal psychologist, not geneticist. My pedigree is simply more than 50 years of training dogs. Since dogs can’t talk with us, the best we can do is assign the same words to them that we assign to ourselves. From the get-go, this is a mistake. Because most words we use with dogs are not absolutes, they are relatives. How about other words we use referring to our dogs: boredom, loving, affectionate, sad, lonely. I’ve heard people say, “He licks my mouth because he loves me so much.” Not true, all dogs lick their master’s mouths hoping to find a morsel of food that has been left behind. Example: Through the years I’ve seen thousands of dogs staked outside on a chain. By the end of the day many of those dogs are wound so tightly they can barely move. I’ve yet to see a single dog smart enough to unwind himself. Am I saying the dog is therefore dumb? Absolutely not. On the other hand, he surely is not smart or intelligent based on our definition of those words. Animal psychologists use the word intelligence when speaking of wolves. But they use that word in the context of describing how a wolf might survive within his surroundings. In other words, they are not using that word within the confines of human description. Rather, it is used as a description pertaining to wolves’ dealings within their environment. Dogs are not rational thinking beings. They don’t plan their day, hope to have steak for dinner, think about winter versus summer, or wonder if tonight is the night that you take them for a run in the park. And they certainly don’t think about that sweet looking Poodle that just moved in down the street! Dogs live in the present…not in the past, and not in the future. Eight hours locked in the basement or yard while you work is not eight hours that they wonder when you will return. If I were to assign a human word as to how dogs perceive time, I would say that they merely exist. “We represent loyalty. We are our masters’ keeper. When you are given to us it is a pact for life…for our life. There is no one in your life that you always think about. It is impossible for you. It is fully possible for us. “Your’s is a life of multiple purposes. You are to be both good and gentle. You are to love one another. And you are to aspire to the kingdom of God. “Your time on earth is challenging and demanding…full of days of wonder and nights of dread. For some life is unbelievably short, for others it endures for many years. You may be prosperous, or you may be a pauper. Your fellow man may measure you as a success or judge you as a failure. You may have been granted the elixir of health or the poison of sickness, pain, and suffering. Yours is a life of the oxen: you are burdened with the gift of choice, you must carry the yoke of life-defining decisions, and you must control the beast of desire. “Loyalty, however, is the defining trait of our kind. We are a pack of the pact. We have accepted the ‘one thought,’ the ‘single purpose,’ and the ‘just cause.’ Because of this we think of you at all times. At the time, I did not realize it would become my most memorable Christmas. I was ten, it was December 20, and I was on angelic-behavior-mode in anticipation of Santa’s arrival. I was traipsing through knee-high snow drifts and blustery winds along near-empty streets with dad. “One more store and we’ll call it a day,” he said. The bell jingled when we entered our seventh antique store. Finally, our search was coming to an end. “Surely, we will find it here,” dad said. The odor was stale and musty, the wooden floors creaked, and dusty antiques were stacked everywhere. Glass bottles piled on old beds and desks, open chests filled with blankets, and walls lined with bookcases, vanities and cupboards. Chairs, couches, and feather-tick mattresses formed a tunnel to the back of the store, where books, toys, old picture frames, lion-clawed tubs, coat racks, record players, adding machines, file cabinets, and mirrors were displayed and priced. We walked through the “tunnel” and shook the cowbell on the counter. The old man’s demeanor changed as if a switch had been thrown. He straightened his slumped shoulders, removed, cleaned, and replaced his glasses as his serious stare studied dad. An uneasiness was building in my stomach. The man sighed and smiled. “Come, follow me.” He led us down a dark hallway through dimly lit rooms and into his living quarters. Dad’s gasp startled me. He was staring at a table in the center of the room. Tentatively, dad reached out and touched the table. “It must be priceless,” dad whispered. “Because of its origin,” he said, softly. “Touch it,” Dad said to me. Its alabaster finish was dull, but its ancient grain ran the length of the table. Six legs formed from hand-hewn timbers were bound to the table with wooden dowels. “Surely it was fashioned by a master carpenter,” dad said. The man did not respond. Again, the man did not respond. On Christmas day, our family gift exchange took place early in order to prepare for my sister’s wedding. The table had been delivered and stood in our living room adorned with gifts, food, and wine. It was, in a word, magnificent. Later in the day, after guests had departed, and my sister and her husband had left for their honeymoon, dad and the antique collector sat at the table drinking wine. Dad and I stared at him; mesmerized. “Jesus’ foster father was Joseph the carpenter. Shortly after the birth of Jesus, Joseph took the Child and Mary to Egypt to escape the proclamation of Herod to kill the first-born child of every family. “During Christ’s childhood, Joseph taught his son the skills of carpentry. And one of the lasting mementos of that father-son relationship was this table. When Jesus returned to Jerusalem, he brought the table with him by donkey and cart. It is said that he encountered a man of God who believed that a savior would one day bring peace and love into the world. Jesus was so taken by the man’s steadfast faith that He gave him the table as a gift, cautioning him, however, that it was to pass only to others who held his strong beliefs in salvation. “There are two carvings in the center of the table,” dad said. Dad leaned under the table and gently touched the engraved symbols. “I accept this table and all that it represents,” he said, as if speaking to all whose initials had been carved. Dad passed away last Christmas…just after he passed the table to me. Yes, I’ve looked. His initials are there. But so is something else. Something I had not previously noticed. After each set of initials, carved ever so small, is the date the table was passed to a new collector. An uneasiness builds in my stomach every time I think about it. In each case the date is the same…December 25th! The Christmas season is magical. There is no other time whereby people share their time, wealth, compassion, friendship, and love for one another as they do during the season of the Christ child. With this thought in mind, I wish for each of you the merriest and holiest of Christmas’. 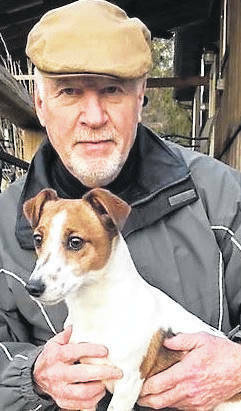 John Preston Smith is the author of The Legend of the Last Dog. All of his books are listed at jprestonsmith.com. Questions or comments: facebook.com/johnprestonsmith. Proceeds support Hoops Family Children’s Hospital in Huntington, W.Va. In addition to dogs, there were other animals I encountered while working at Animal TV Trainers in Washington, DC. From 1963 to 1966. Margays and Ocelots are not the size of big cats, still, a deep scratch, bite, or pounce from a 50 to 100-pound cat be tragic. As a trainer, it did not take long to learn that wild cats are not trained, rather they are tamed. Skunks are great pets. BUT, be sure to start with one that is de-sacked. I made the mistake of purchasing one that was supposed to be…wasn’t…and four stores on 14th street in downtown Washington closed that day. My Boa was named Noah. If you could straighten him out he’d push six and a half feet. Some snakes will not eat in captivity, Noah was one. Once a week I’d have a lottery-drawing of white mice. I’d take the chosen one by the tail, whack him on the counter to knock him out, and then force-feed him to Noah. The force-feed part sounds easy. It wasn’t, especially if Noah was moody. While Noah wrapped his body around mine, I’d force his mouth open, and with the eraser-end of a pencil, I’d push the whacked-out mouse down his throat. Birds are easy to train based on one concept. They always walk to the highest point. Therefore, scaling a ladder, traversing a tight rope, or walking from your arm to your shoulder is an easy trick, all based on the ‘highest point’ theory. Our ‘shop bird’ was a Military Macaw by the name of Ole Momma. Her wingspan was over three feet, and she could bend a small piece of metal with her beak. When she was out of her cage, she rested on a T-bar with a do not touch sign attached. She was a major attraction. Ignoring the sign, a know-it-all lady reached up to pet the chest of Ole Momma, who immediately jumped on the lady’s wrist while squawking and wildly flapping her wings. Aghast, the woman dropped her arm, trying to shoo the big bird away. Ole Momma would have none of it. Based on the highest point theory, she skirted up the lady’s arm, to her shoulder, and removed an earring while the lady screamed, and our customers applauded, thinking we were providing entertainment. I retrieved Ole Momma while pointing to the ‘do not touch’ sign. The woman ran out of the store and never returned. Note: It’s not just the “do not” touch signs in pet shops that people have trouble with. I’ve come to realize that the words “do not” are somehow offensive to the human psyche. Those two words seem to challenge us, turn us into super-beings, and let lose within us an uncontrollable force of opposition. Other challenging examples that humans slave over; do not enter, do not turn, do not smoke, do not take drugs, do not lie, do not jay walk, do not text, do not kill your neighbor. Mynah birds are conundrums. They can talk, whistle, and find the smallest sun flower seed at the bottom of the food bowl. They are loud, outspoken, and they sling food everywhere. Note: always teach birds to talk before teaching them to whistle. If first taught to whistle it is near impossible to get them to talk. Chimps are a challenge. Back in ’63, exotic pets were not difficult to bring in to the US. We ordered one for a client and three months later a four-foot square wooden crate arrived at the shop. Hester had been boxed up for 48 hours, and from the sounds inside the crate, he was not a happy camper. At 70 pounds, he obviously was not the baby we ordered, rather he was at least two years old. I was given the challenge to uncrate him, and, knowing that God never created a monkey that wouldn’t bite at maturity, I was sweating profusely. I tried verbal enticement, food, and water. He wouldn’t budge. Finally, out of desperation, I balled my hand into a fist, and reached in. He grabbed my fist and put it in his mouth. I immediately realized this was not an act of aggression, if so, he could have taken my hand off. I leaned in the crate and soothingly, talked to him. The stalemate was on. Fifteen minutes later, he released my hand, bounded from the crate and jumped into my arms. Hester and I became best buds until he had to leave for his new home. Lastly, I want to tell you about Boomer, an attract-trained Doberman Pinscher. My boss told the client that I had a special knack with dogs and that I could de-synthesize the big dog. Boomer belonged to a local policeman, who had been shot on a drug bust. The cop was forced into retirement but could keep his dog. He had heard of the work my boss had accomplished with dogs and asked for our help. About midnight one evening, I was working with Boomer on 14th street when gunshots shattered storefront windows and burglar alarms screamed. I froze, until Boomer started pulling me in the direction of the gunfire. He wasn’t in a hurry. Each step seemed measured and calculated. A team of horses couldn’t have held him back. Two men burst through the broken windows of a jewelry store and skidded to a stop as flashing lights and sirens approached. I don’t know where my voice came from because at the time I was scared to the point of…well, you know. “Get ‘em” I yelled as I dropped the leash. He lunged for the criminals. Yeah, I know. This column was supposed to be about animals other than dogs…but, I just couldn’t keep myself from telling you about Boomer! John Preston Smith is the author of nine novels, all are listed at jprestonsmith.com. Questions or comments: facebook.com/johnprestonsmith. Proceeds support Hoops Family Children’s Hospital in Huntington, West Virginia. John F. Kennedy had a profound effect on all of us not yet encumbered with stone-hard impressions of what a President should be. He was endowed with so much charisma that the entire country had its spirit lifted, just knowing he stood for them. As such, his murder on that grey, November day of 1963 brought all of America to its knees. The collective feeling of loss was profound. All forward motion came to a halt. Words of solace rang hollow. Faces were white and cold. Everywhere was deathly quiet. It was the day the music died…too, it was the day that America’s newfound hope died. Teachers interrupted classes with the somber news. Children found their mothers weeping and their fathers arriving home from work visibly shaken. Families piled into living rooms to watch television, glued to the news out of Dallas. Our leader had fallen. We all encounter life changing events: tragedies, celebrations, or unforeseen revelations and encounters that come upon us in the blink of an eye. Events never foreknown, or prearranged, or expected. Events that shake us to the core…events that change our lives to the end of our days. A health scare, witnessing a shooting, an airplane that suddenly drops 1,000 feet before the pilot regains control, fighting in Vietnam when your outpost is overrun, watching in horror as towers collapse in New York, the murder of a friend or family member…there’s thousands of examples. You know what they are, dear reader…they’ve happened to you. For me, President Kennedy’s death was the beginning of three days that melded into a life-changing experience that, since that time, has deeply affected my outlook on life’s precarious nature. In 1963, I was an Information Specialist in the US Army stationed at Fort Lesley J. McNair in Washington, DC. Two months prior to the shooting, I had briefly met President Kennedy when he paid a visit to the Tomb of the Unknown Soldier (as it was known back then). Three days after his death, he was buried in Arlington National Cemetery. My life-changing event lasted those three days. From the moment he was shot until his wife, Jackie, lit the eternal flame at his gravesite. I was part of the Army public relations team in the Military District of Washington. Not only was our office tasked with providing information to the news media regarding any contingent of the US Army that would be participating during any of the events of the upcoming weekend, but too, it was our responsibility to plan and monitor all media stations along the route of the funeral procession. Keeping in mind that members of the news media were converging on Washington from all parts of the world. For 21 hours, President Kennedy’s body lay in state in the Capitol Rotunda. More than 250,000 people paid respects. For reasons I cannot explain and do not understand, most of that weekend was a blur. I remember the activity level was beyond hectic, I remember working night and day, providing news releases, fielding questions from thousands of members of the news media, and mostly, preparing for the coming Monday, the day of the President’s interment. At 10 a.m. on the morning of the funeral I was taken by military vehicle to the cemetery where I would wait until the procession arrived around 2:43 p.m. More than a million people lined the streets…many cried openly. Throughout that day I was stationed on a wooden platform that had been constructed below the Custis-Lee Mansion (today known as the Arlington House) and just above the burial site. That platform held approximately 100 members of the media. Well known pictures of the cortege (funeral procession) crossing the Lincoln Memorial Bridge with the Lincoln Memorial in the background were taken from that platform. Following mass at Saint Matthews Cathedral, the casket was carried by a horse-drawn caisson to Arlington National Cemetery. (A caisson is a two-wheeled cart designed to carry artillery ammunition and is used to bear the casket of the deceased in military and state funerals). Black Jack, a coal-black Morgan-American Quarter Horse followed the caisson with boots reversed in the stirrups symbolizing a fallen leader. I remember that there were certain notables I looked for at the gravesite. The ones I recognized were the Prime Minister of Canada, Lester Pearson, the Emperor of Ethiopia, Haile Selassie, President Charles de Gaulle of France, and Prince Phillip and Prime Minister Alec Douglas-Home, both of the United Kingdom. There were others, but these were the dignitaries I wanted to see. Kennedy’s funeral was the largest gathering of foreign dignitaries at any funeral in the United States, drawing 220 foreign dignitaries from 92 foreign nations, including 19 heads of state. There were sights and sounds that will stay with me until my death. Muffled drums, steel horseshoes as they struck the pavement, Black Jack, the jet flyover, taps, “Ruffles and Flourishes,” “Hail to the Chief,” a detachment of cadets from the Irish Defense Forces performing a silent graveside drill. And at the end of the service, I watched Mrs. Kennedy light the eternal flame. At 3:34 p.m., the casket was lowered into the ground. On November 28, 1963, Thanksgiving Day, Mrs. Kennedy visited the gravesite. I was there representing the US Army. It was an unexpected visit. A simple white picket fence, maybe 20-by-20 feet, surrounded the grassy gravesite with the eternal flame flickering in the wind. Thousands stood in line behind a single strand of rope that seemed to stretch forever. After kneeling and saying a prayer, she opted to walk around the gravesite and view it with Washington as a backdrop. It had been raining and the ground was slippery. I took her arm to steady her from falling and expressed my sympathy. She merely nodded, but it was a sincere expression of appreciation. That life-changing event was 55 years ago…. or was it yesterday? John Preston Smith is the author of nine novels, all are listed at jprestonsmith.com. Direct questions or comments to facebook.com/johnprestonsmith. Proceeds support Hoops Family Children’s Hospital in Huntington, W.Va.
“Dog training affirms that his natural instincts and skills can be encouraged and developed.” UnknownIn my early years as a dog trainer, I realized most folks I encountered considered their canine companion to be more than “just” another friend. Let’s face it. How many friends do you make excuses for when they to poop on the carpet, shred your curtains, pee on your pillows, chew your shoes, jump up on you with muddy feet, or run away just because you left the gate ajar? The pack instinct. They crave leadership, companionship, and family. They are social. Whether it’s just you or a large family, they can be perfectly content. The territorial instinct. Yes, this can be problematic. It’s why they chase cars, the mailman, all delivery men, squirrels, rabbits, other dogs…and it’s why there’s a dirt path worn along the front fence. But, in their minds, they are protecting your property and your life. It’s a pretty good trade-off if you ask me. They have an uncanny knack of adjusting to our needs, wants, desires, and wishes; no matter how quirky or peculiar we might be. There is a breed of dog that will fit into every lifestyle, whether you hunt or fish. Whether you live in the country or a city apartment. Whether you travel or are solitary. Whether you desire a companion, protection, alarm, or guard dog. Whether you are a car salesman or a car thief. They come in every shape, size, and color… except plaid. You can find one that’ll fit your disposition, whether you are content, gloomy, cranky, crabby, outgoing, sullen, cheerful, controlling, submissive, or ecstatic about life. SIGHT: Not too many years past it was believed that dogs’ sight was limited to black, white and shades of grey. Research today indicates that they also see shades of yellows, blues, and violets, although much more limited than you and I. It is interesting that dogs recognize movement at a much greater distance than humans, yet the human eye maintains focus at a much greater distance than dogs. On occasions, I have noticed my dog’s blank stare into fields where deer roamed. It was only with concentrated effort that I could distinguish the movement that he so easily recognized. Therefore, it would be to your advantage when training your dog to consider using hand signals. Believe it or not, some dogs are easier trained with hand signals than verbal commands. TOUCH: Most important during the socialization period. Once grown, however, they may or may not respond to petting, caressing, or fondling. Many obedience dogs, however, will work extremely hard for simple pat on the head. Research indicates that dogs respond to physical pain to the same extent as humans. HEARING: Voice inflection and single words enhance his understanding of what we want of him. The words we use and how they are pronounced can encourage, discourage, excite, or demoralize. They hear sounds of a much higher pitch than humans and they hear faint sounds that we cannot detect. We’ve all experienced our dogs’ barking a welcome or warning of a coming automobile well before the sound of that engine reaches our ears. SMELL: This is where the world of dogs and the world of humans separate. Imagine a bloodhound on the heels of a killer. He may be following shoe traces left on plants and dirt, or skin rafts (dead cells) lying about or floating in the air (we shed 30,000 to 40,000 skin rafts every hour.) It may be raining or snowing, and the track may be days old. Maybe hundreds of people and other animals have contaminated the original traces. Yet, the dog persists, never tiring, never quitting, until he finds the culprit. He has an uncanny ability to smell or sense chemical changes all around…in the air, on the ground, and on your body. He does not know that death approaches, but he does sense the chemical changes your body gives off whenever you have a significant mental, emotional, or physical change. TASTE: Dogs have about 1,700 taste buds as opposed to your 9,000. Mostly they are around the tip of his tongue. But, he will also eat trash, antifreeze, or other toxic foods that may be poisonous. If you have an outside dog, and you have cranky neighbors, or have concerns regarding intruders, you might consider poison-proofing your dog. However, study the process thoroughly before proceeding, better still, enlist services of a professional trainer. Knowing and understanding how a dog perceives the world through his sense of sight, touch, sound, small and taste, without question will make you a better owner, handler, and trainer.